Yesterday started off sunny, but as the day progressed, dark clouds began to fill the sky. I was driving home from a day of running errands and I felt like a storm chaser -- minus the tornados. Where I was at, it was sunny and clear, but I was driving right towards a completely black sky with some of the most wicked lightening I've ever seen. It was really cool though; a little scary, but mostly cool. Anyway, today looks like it's going to be a repeat of yesterday weather wise, so I'll have to plan my run accordingly. I'd like to take this time to thank everyone who e-mailed me asking what happened to Jethro the Lizard; the response was overwhelming! I never expected that many people to inquire about his demise, so thank you! If you're one of the unfortunate few who still haven't found out the truth, don't worry, it's not too late – I'd be happy to tell you the rest of the story. You have until May 14 to ask me. Oh my, that's only 10 days; what a reality check. I can't believe I'll be on a plane for the summer in 10 days. This last month definitely flew by. Yikes! The most exciting thing going on in my life right now is sorting out what I'm going to bring on tour and what I'm going to leave behind. I suppose that's one of the perks of not being in school right now -- not having to deal with dreaded finals. 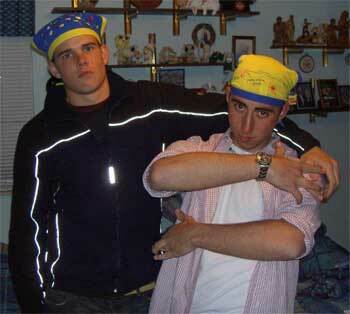 Matt and Will, in their best thug pose, with yes, women's underwear on their heads. It was their hype for the race. Sarah decided to stick with a headband, which is why she's not pictured. I do still have to deal with my job though, but only until Sunday, which is my last day. But oh what a day it will be. Sunday is Mother's Day, which means everyone in the restaurant has to work from 10:30 a.m.
until 11 p.m. I feel so privileged. Apparently it's going to be nonstop madness, which means I should make some much-needed tour money. The disappointing thing is that I wanted to spend time with my mom and the rest of the family that day. My sister is even flying in from New York. They were talking about coming in to eat just so they could be with me, which was very thoughtful, but I think that would just make me more sad. Cadet ageouts (now administrative staff) and one current Cadet drum major. They all attend Ithaca College -- but you probably could have figured that out by their title. Anyway, over the past few months this crazy team has been training to run marathon –- the Flying Pig Marathon in Cincinnati to be exact. What happened? Well, why don't we hear from one of the members of Team Ithaca, and someone who makes frequent appearances in my articles, Mr. Matthew Haines. Take it away Matt! Thank you Paula for once again giving me the opportunity to contribute a portion of your column! We left from Ithaca, New York at about 2 p.m. on Friday and didn't arrive in Cincinnati until 11 that night. You might be wondering why we chose to run a marathon so far away. Well, we began training in November and needed to find a race that would allow us enough time to prepare. The book we were using gave a six-month training schedule, so the only marathons that wouldn't require a plane ticket were Boston and Cincinnati. To run Boston, you need to have earned a qualifying time at another marathon -- so the Flying Pig Marathon in Cincinnati was it! I know, I know. The Flying Pig Marathon sounds pretty intimidating, huh? Actually this race has a reputation for being one of the nicest 26.2 miles in the world! Supporters lined the streets almost the entire way, water and Gatorade was available at least once a mile, and there were portable toilets galore! We ran through parts of Kentucky, over the Ohio River, right into Cincinnati, and touched several of its suburbs. Anytime you even considered getting bored there would be some form of entertainment to keep you smiling. There were several rock bands along the way, a trombone choir randomly showed up at mile 15, and a not-so-musically-inclined heavy metal group yelled into their microphones at mile 17. When we were turning the corner for mile 20 (nicknamed "the wall" by many marathon runners because it's usually the spot your body thinks you're actually dying, forcing it into survival mode) we were greeted by a strategically placed 60-member gospel choir singing "Halleluiah!" No matter how tired you are...nobody wants to endure the shame of stopping to walk in front of a 60-member gospel choir. Paula wanted me to tell you what kind of stuff was going through my mind as I was finishing. Basically it's a lot like what you're thinking after you finish your last performance of the drum corps season. We had invested SO much time into training for this thing and now we were actually reaching our goal. Think about it -- there aren't that many people in the world who start working for something that won't see any sort of payoff until six or seven months later. That's one of the things that amazes me about drum corps. A girl will be standing in her dorm room in November with sneakers tied to the bell of her euphonium, holding that monstrosity until her arms break off. Or there'll be a guy drumming on his pad in December at 2 in the morning, trying to memorize show music. It won't be until at least mid-June before someone even claps for them -- but they're driven to do it anyway. Pretty incredible. While we will probably never run a marathon again as a trio, all three of us plan on entering more in the future. Will and I plan on trying to qualify for Boston next spring by running the NYC marathon in November -- so cheer us on if you're in the area! Thanks for reading! --Rudy is the man (Are you happy now, Justin?). Paula Hyman is a fourth-year member of the Cadets where she is the mellophone section leader. She is 20 years old and currently single. Originally from South Florida, Paula recently made the move to Allentown, Pa., to work for YEA!, the umbrella organization of the Cadets, Crossmen and the U.S. Scholastic Band Association. She ages out in 2006.